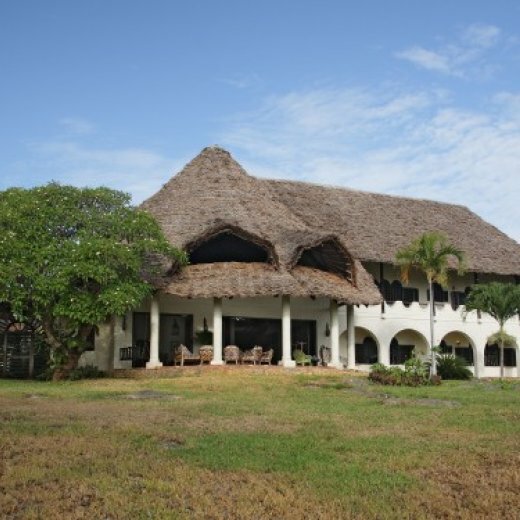 The house is situated about 20 km south of Mombasa, on Tiwi beach overlooking the sea with direct access to a quiet stretch of white sanded beach. This is a perfect place to totally unwind, with long beaches for walks, and clear warm water to swim in, It’s a home from home. The pool and the exposed reefs and their rock pools, as well as the safe and secure cool environment of Sandarusi make it a haven for children. The house has direct access to the beach, beautiful soft white sand, which you have practically all to yourself! All 6 room are en suite and airy, each with an individual and unique charm/ identity. The spacious rooms, open verandahs, garden, pool among the Baobabs and Tiwi Beach are favorable to visitors of all ages. Wheelchair access is available to the lower levels only, which does have bedrooms on that level. Baby cots are available upon request. Fresh sea fish, prawns, and other shellfish are brought to the door by the local fishers, as is a great selection of seasonal coastal fruit and vegetables by the farm traders. The house comes with an excellent cook, houseboy, gardener, and night watchman to care for your daily needs. The house is fully equipped with hot water, electric/gas cooker, refrigerators, freezer and a safe for smaller items or valuables. The house has Group 4 Security, and a fully employed guard.